If you’re an April fool for hummingbirds, it’s easy to remember April 1 as a humdinger of a day – the day to hang the hummingbird feeders every year. Ruby-throated hummingbirds keep to their schedules. Spring’s first migrant hummers usually arrive in East Tennessee in early April. Be ready. 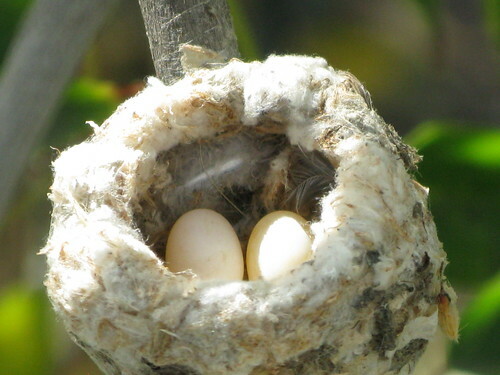 The same individual hummers that visited your yard last year may come back this year. They’ll be looking for the feeder in the same place where it hung last year. Don’t let them find an empty space. The formula for homemade nectar is 1 cup white cane sugar dissolved in 4 cups of water. Boil gently two or three minutes to retard spoilage and to fully dissolve sugar. Store in refrigerator up to a week. Don’t use honey or artificial sweeteners. It is not necessary to use red food coloring. 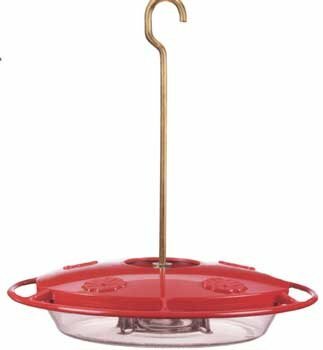 After the feeders are up a few days, most of you will probably start wondering why you haven’t seen any hummingbirds yet. Check the hummingbird migration map at www.hummingbirds.net to see just how far along the ruby-throats are on their journey to nesting sites as far north as Canada. Ruby-throat enthusiasts across eastern North America report their earliest hummer sightings. Different-colored dots on this year’s 2010 migration map show early arrival dates so far. Look at prior years’ maps for the complete picture. Over 5,000 people reported their first hummer sightings in 2009. Report yours in 2010. This year ruby-throats were sighted in Middle and West Tennessee by March 20. They usually arrive later in East Tennessee. Between now and late April – when courtship and nesting activities begin – plant some flowering perennial hummingbird plants. Select some plants that bloom in April, when large numbers of hummers pass through on migration every year. Next April your yard will be even more attractive to migrating hummers. Offer water in a way that helps migrating hummers take a bath. Hummers wet and preen their feathers to keep them in top shape for flying. They don’t bathe by splashing around in bird baths. They shower. We will be putting up the feeders early to see if we have some scouts! WASHINGTON, Mar 19, 2009 (UPI via COMTEX) — From Atlantic beaches to Midwestern prairies and Hawaiian forests, one-third of the 800 U.S. bird species are in danger, a report released Thursday said. “The U.S. State of the Birds” is based on data from three bird censuses, including the annual Christmas bird count organized by the Audubon Society, Interior Secretary Ken Salazar said. Hawaii, where species found nowhere else evolved on the island chain, has more endangered species than anywhere else in the country, the report said. But it also found 40 percent declines in grassland species in the past 40 years, a 30 percent drop in desert birds and a 39 percent decline in ocean species. There was one note of hope. Many wetlands species like herons and ducks have rebounded because of restoration programs. ASHLAND (AP) – Much like Punxsutawney Phil and his fellow groundhogs, sightings of the American robin are considered by many to be a sign that spring either is here or soon will be. Recently, a couple friends and I heard and spotted several of the orange-and-black feathered friends – the state bird of Wisconsin, Michigan and Connecticut – on the west side of Ashland. During a newsroom discussion of the sighting, fellow Daily Press reporter Rick Olivo said he, too, saw several robins during a trip to Madison last month. The environmental reporter in me immediately wondered whether evidence of global climate change could now be seen outside my window: “I shouldn’t be seeing these birds for at least two or three more weeks,” I thought. As it turns out, some of the birds choose not to live up to the second half of their species name, Turdus migratorius. Instead, they opted to stick around northern Wisconsin and tough out the winter like the rest of us – with the exception of the so-called human “snow birds,” of course. For robins and other winter birds, it’s simply a matter of sprouting a few more down feathers for extra insulation and finding a steady source of food. Frozen ground means no worms and frozen air inhibits crowds of insects, so robins and other birds like cedar waxwings will seek out fruit from crabapple trees and other berries still hanging on branches. Verch said participants in the 2008 count spotted 76 robins – 56 more than the previous record of 20, set in 2004. If you’ve never seen a robin in January, you’re not alone. Jim Paruk, associate professor of biology at Northland College, said those who do notice them are typically “intense birders” who know where to look, such as ravines and gullies that offer birds shelter from the elements and from predators like hawks and cats. “We’re going to see a lot of interesting things in the next 20 years with bird distribution,” he said. As far as the robins are concerned, though, it appears northern Wisconsin is not the only hot spot for the winter. Lewis said he’s seen a number of reports in the Twin Cities about increasing numbers of robins that spend their winter in the big cities. “I think people are starting to accept it as almost routine,” he said. If you hear a robin singing in February, or even the call of the northern shrike, chances are they’re just warming up their vocal chords, since the male birds sing to both attract a mate and to claim their territory, Paruk said. The cardinal was not found in Illinois until about 100 years ago, when population density forced it farther north, according to local bird surveys. Its story is an example of non-climate-related bird range shift. Bird ranges have shifted progressively northward over the last 40 years. The Audubon Society has controversially linked this shift to climate change. “Center of abundance” refers to density. Gradual increase in temperature in the continental United States is responsible for bird range shift, says the Audubon Society. Chicago residents discover their feathered neighbors. Also in Northwest Indiana at Songbird Prairie Bed and Breakfast. Recent media coverage of Audubon’s finding has missed the point, said Libby Hill, a vice president of the Evanston North Shore Bird Club. The Birds and Climate Change report has been described as an analysis of a shift in bird migration patterns. To accurately convey the report’s findings, Medill Reports asked Judy Pollock, director of bird conservation for Audubon Chicago Region, to straighten out these misconceptions. This study has been widely misinterpreted by the media as reflecting trends in bird migration patterns. Why is this inaccurate? The study is about bird range, not migration. Every bird has a range. You could look in a field guide and find a range for every bird in it. And it’s got a southern end and a northern end. In fact, each bird has a winter range, a summer range and a kind of a migratory pathway. What Audubon was looking at was the winter range, which includes some birds like the cardinal that are just here all year round. It also includes some birds that are only here in the wintertime. With migratory birds, there are a lot of ways that global warming might be affecting the timing of their migration, but that has nothing to do with the study that Audubon just did. It’s just another issue that’s out there relating to global warming and birds. How is climate change affecting bird migration differently than bird ranges? When migratory birds arrive, they’re used to the fact that certain trees are budding out and certain insects are eating those tender leaves, because they eat those insects. So what happens when people start screwing with those relationships? Well, the trees start budding out earlier, so then the birds have to migrate out earlier. Or maybe they have to learn to rely on a whole different set of resources. That puts extra stresses on them. There’s a whole complicated set of relationships related to migratory birds and the resources they’re used to using. 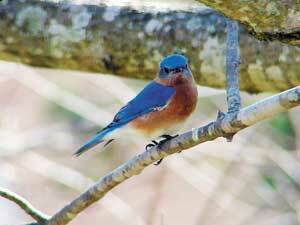 We’re seeing that some birds are starting to migrate out earlier and some aren’t. That has nothing to do with this current Audubon study. But it’s another issue out there that it’s important to understand. It happened so gradually you might have missed it. For the past 40 years, birds have been making a nationwide run for the northern border, and a controversial recent study blames the warming climate. In February, the Audubon Society released an analysis of data compiled over almost half a century that they say suggests that a slow, northbound shift of wintering grounds for almost every type of North American bird was directly linked to global warming. More than 60 different bird species exchanged their current winter ranges — the areas they settle in during colder months — for new ones more than 100 miles north. The study combined two sets of data to arrive at its conclusion that “while causation is nearly impossible to prove, global climate change is the most likely explanation” for the birds’ range shift. The first data set was 40 years’ worth of figures from Audubon’s annual Christmas Bird Count, a methodical head-count of local bird numbers conducted by hundreds volunteers all over the country. The results of each volunteer’s findings were aggregated over 40 years to reveal the range shift trend. The numbers revealed the presence of large numbers of bird species in areas they have not been found historically. Ron Zick, owner of birdfeed store Wild Birds Unlimited in Glenview, said the findings seemed skewed. Zick said many explanations exist for range shift other than climate change. Some bird species, he said, might have begun including Chicago in their winter range to avoid the competition they find in warmer locales. According to Zick, other birds, such the house sparrow, were forced to expand their range westward because their East Coast habitats could no longer support their growing population. What about the unusual bird sightings? According to Zick, they’re a reflection of the birdwatchers’ ambitions, not range shift. Dale Humburg, chief biologist for Ducks Unlimited, a waterfowl conservation group, said analyzing this kind of data is never a simple issue. Humburg said that in the short term, it’s difficult to discern the impact of climate change on birdlife. However, over decades, the results become clearer. “I think if this continues,” Humburg said of global warming, “we could very well see a dramatic impact on birds. I see great potential threats under a changing climate. This is the larger of the two chicks at 25 days old and is now officially a fledgling. Although still fed by the mother, he is now feeding on his own!! He flies around (like a seasoned pro) the tree visiting the flowers with the greatest ease! 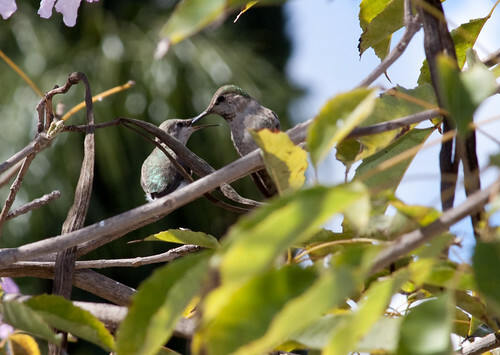 To view the set of photos documenting this Hummingbird family (including my notes) click here.